“It’s a great learning experience for everyone. The children are quick to learn how to use the microscope,” said DOC Science and Capability Honorary Ranger Dr. Karin Mahlfeld. Run by a few of DOC’s Science and Capability Volunteers, the Open Lab is a mobile laboratory that is free for the public. A portion of the equipment, including microscopes and laptops, were kindly loaned to the Open Lab from The Clinic, a community-led learning initiative at Ngaio School. The Open Lab aims to increase general awareness of invertebrates and provide an educational opportunity for the public. The Open Lab made one of its first appearances at Zealandia on Saturday 18 July. Over 50 participants showed up to utilize the lab’s equipment. Given the wet weather during the Open Lab at Zealandia, this was a perfect opportunity for families to get their hands their dirty while staying dry. “The Open Lab brings the outdoors in! It’s a great activity when it’s raining,” said Kate Studd, chemical engineer and mother of two. Mayflies were the most common invertebrates identified at the Open Lab at Zealandia. Scientists were particularly excited to find a leaf-veined slug, which is a member of an ancient family of terrestrial molluscs. This particular species is commonly found around the Wellington region and looks just like a gherkin. You can join the fun at the next Open Lab, which will be held at the Cockayne Centre at Otari-Wilton’s Bush on Sunday 23 August from 2-4pm. This week we welcomed Karin, Natasha and Dave into the studio, three scientists behind The Open Science Lab, a recent initiative focused on promoting knowledge of New Zealand´s biodiversity. Starting in 2015, the initiative operates as a not for profit pop up openlab, spreading knowledge of biodiversity in New Zealand with a particular focus on invertebrate. Indeed, the Lab´s short term goal is to “grow biodiversity awareness in all things cold-blooded and spineless.” They achieve this by arranging openlab days with schools and other organisations, such as Wellington Zoo and Otari-Wilton´s Bush, providing children and adults with the chance to sieve through leaf litter and find critters to view up close. Experts are on hand to answer questions and facilitate the use of microscopes and other equipment. Besides size, the major difference between lobsters and crayfish is that lobsters live in saltwater, such as oceans and seas, while crayfish live in freshwater, including lakes, rivers, streams and ponds. A special visitor at the Open Lab is the freshwater crayfish or koura. This little guy is in gradual decline and is ranked on the threatened species list. Creative minds are increasingly turning to nature for inspiration and fresh solutions in design, sustainability and engineering. Wellington Open Science Lab endeavours to spark awareness and interest in biomimicry, a dicipline of growing influence. Last Friday Otari School senior students and Open Science Lab came together for a session on biomimicry dealing with bird flight, feathers, butterfly wings and the lotus effect. “Biomimicry is an approach to innovation that seeks sustainable solutions to human challenges by emulating nature’s time-tested patterns and strategies. The goal is to create products, processes, and policies—new ways of living—that are well-adapted to life on earth over the long haul. “When we kill off the natural enemies of a pest, we inherit their work.” – C.B Huffaker. Many plants rely on insects for pollination and friendly bugs often need the pests for food. Along with healthy soil, insect diversity is your garden’s first line of defence. How dynamic is your patch? What wonderful spineless critters care for your garden? At the Pest Fest the Open Lab popped up with gardening guru Sarah Melvile at the ready to help us invertebrate enthusiasts share the signs of a healthy garden! We sifted though leaf litter and found lots of great recyclers such as woodlice and earthworms. Spiders were plucked up and added to our spider spacer and wiggly worms to our wormery (made by us, design inspired by Nick Baker from his book Bug Zoo). Pollinators are another beneficial insect to have in the garden. Overseas research into spiders as pollinators is gaining momentum while we admire the hoverfly and it’s contributions. They are relentless predators, I’d have them at my place over filth flies (such as the common house fly) any day! Hoverflies might look like bees but they have no sting and only one set of wings. They’re flies with a wonderful purpose and helicopter dance. There’s no need to fear these ladies either, parasitic wasps, don’t sting but seek and destroy many pests. The spike on the back is not a sting, it is an ovipositor (for laying eggs). Can you spot a good bug? What if that bug is at the larvae stage? A gardeners favourite to gobble up the aphids is the ladybird. Its larval form looks nothing like itself! And the lacewing does impressive work in the garden too, check out it’s larval state. So let your garden come to life and think before you spray, because everything in it’s path will get wiped out, not just the pests. Landhoppers were jumping mad at the Open Lab today. You’ve got to be quick to catch one of these. These critters have a shrimp like appearance and can jump and burrow, fast! They feed on decaying vegetation and keep the soil turned over and healthy. (Photos from our session will be uploaded soon). Scientific name: phylum Arthropoda, class Crustacea, subclass Malacostraca, order Amphipoda, family Talitridae. Dobsonfly larvae were a popular find at the Open Lab today. They are amongst the largest of our freshwater insects. These ‘toe biters’ appear caterpillar-like and possess gills along the sides of their abdomens. The larvae are active predators of other aquatic invertebrates and have strong mandibles with which to grasp their prey. Archichauliodes species (CORYDALIDAE) its Marori name is puene. Lady beetle larvae and adults eat aphids, small caterpillars, mites and random insect eggs. 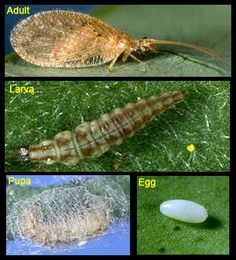 A few species specialize by feeding on scale insects, mealybugs, mites and even powdery mildew. 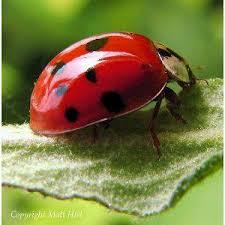 Adult lady beetles also eat insect honeydew, flower nectar and pollen. How to Attract Ladybugs ?